Each of these towns represents a different element of America’s development. Yet they all share the same fate: they, and hundreds of other communities like them, were vacated, demolished and flooded to make way for dams and reservoirs. Their remnants persist, preserved underwater, and sometimes emerge, as reminders of what was not allowed to be. 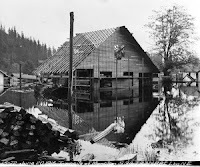 Beginning in May 1915, the community of Moncton, located along the northern shore of Rattlesnake Lake, experiences one of the slowest floods in King County history. Throughout the summer, the lake is fed by seepage from an upstream dam, causing it to slowly rise. 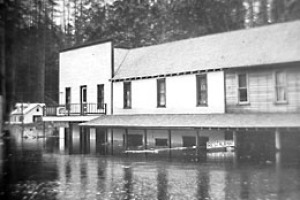 By the end of the year, Rattlesnake Lake inundated the town, which was later condemned. In 1906, the Chicago, Milwaukee & St. Paul Railway was built through the Cedar River watershed to provide access for the water department workers and their families who lived in nearby Cedar Falls. In a short time, a new community was built on the rail line a half mile north of the generating station at Cedar Falls. Located along the shores of Rattlesnake Lake, the new village was named for one of its settlers, a Mr. Moncton. Whereas the Seattle Water Department owned worker homes in Cedar Falls, private individuals owned most of the houses at Moncton. The idyllic setting along the lake was ideal for many water, logging, and rail workers who wanted to own their own property. By 1912, Moncton “absorbed” the name Cedar Falls, due in part to urging from Seattle Water Department Assistant Engineer, J. D. Ross, but many who lived there continued to call it Moncton. ﻿By 1915, more than 200 people lived in Moncton, and the fledgling community had a hotel, a barbershop, a saloon, a restaurant, a few stores, and even an indoor swimming pool. A school on the north end of town provided education for children up through 8th grade. Older students had to walk or ride a horse seven miles to the nearest high school in North Bend. At the turn of the 20th century, Seattle was a quickly growing city in the wilderness of the Northwest. Between 1900 and 1910, the population of the city more than doubled, causing the city to have an infrastructure problem. The city needed power and needed it quickly. By the spring of 1915, the pool behind the dam that would later become Chester Morse Lake, began to fill up. Throughout the clear-cut hillsides that rainy season, nearby residents started noticing springs erupting out of the ground. As the lake rose, springs turned into geysers. Leakage was so bad that the lake behind the dam started to lose water faster than it could fill up. The water was dropping as much as an inch an hour of 4.2 million cubic feet a day. This is when the city noticed they had a problem on their hands. 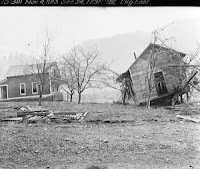 According to an article written a few years later the incident, "While the dam was on a rock foundation, that foundation was plainly but a spur of rock." As more water filled the pool, and more rain fell from the skies, more pressure caused more mini-geysers to erupt in the hills above Moncton. The excess water in the moraine had nowhere to flow but into Rattlesnake Lake. Slowly the lake began to rise. First, the water edged up to the homes nearest the shoreline. A few days later, the streets muddied, and after that, standing water filled the lower section of town. At first, residents may have hoped that the slow-motion flood would somehow be diverted elsewhere, but it soon became apparent that their community would be underwater by summer’s end. During the month of May, the water rose a little over a foot per day. Rowboats and a barge were floated in so furnishings and personal items could be removed. After that the levels kept increasing to the point where houses popped off their foundations, causing them to float like corks into the middle of the lake. Moncton residents kept a stiff upper lip and hoped for the best. Although many were now homeless, those who worked for the water department or the railroad were sheltered in tents while new homes were built for them. Others were out of luck. The school, located on higher ground, was still in use, but a storm ripped its roof off, and classes were moved to a church on the south end of the lake. By the time Rattlesnake Lake stopped rising, the buildings on the south end were the only ones spared. Worried that the wreckage-strewn lake would next seep into the watershed, the City of Seattle condemned the town of Moncton. A total of $47,658.03 was paid to residents for their land. The next year, water levels receded enough for Seattle City Light to finish off the town. A crew of workers was sent in to tear down the waterlogged homes. A few were salvageable and were bought by nearby residents and moved to higher ground. The rest were torn apart, soaked in kerosene and lit afire. What water couldn’t destroy, flames quickly erased. For a long time afterwards, Cedar Falls residents were not allowed to swim in the lake for fear of further contamination of the water supply. Years later it was discovered that the moraine had filtered out impurities. The lake was once again opened to the public. In 1970, Rattlesnake Lake Park was created, and the lake is now used for boating, fishing, and swimming. Today, little trace of Moncton remains, except for the adventurous. Those with scuba gear can probe the murky depths of Rattlesnake Lake and still find the foundations of this short-lived town. This is one of the best write ups I've read on Moncton. I grew up and currently live in Wilderness Rim which is on the other side of Rattlesnake Ledge and I've never heard of some of the things you've written about here. We had a record dry summer so the lake is currently so low that you can see a few of the remaining foundations and some other remnants that are usually under water. I found several spots where there are what appear to be fence pickets vertically buried pretty deep into the ground in small rectangular shapes (I was trying to figure out what purpose they served). Some of these things I've seen in past years when the lake was low, but I've never seen as many remnants as are visible this year. Seeing it has made me re-research the lake history and Moncton as I'm completely fascinated with it. Judi Heit is a history buff who's done genealogical research for over 40 years. 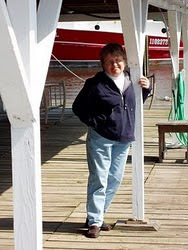 She and her husband, Ralf, live in Oriental ~ the Sailing Capital of North Carolina.